VIEWING THE HUGE REQUEST, YOU WILL ADD 7 NEW DATES! A return on the wings of success, that of Giorgio Panariello, Carlo Conti and Leonardo Pieraccioni in their Florence. At 8 evenings already scheduled at the Teatro Verdi from December 28th to January 6th 2019, 7 new appointments will be added until January 13th, given the enormous demand for tickets. Among these is the evening-event of Monday, December 31, where friends of all time GIORGIO PANARIELLO, CARLO CONTI and LEONARDO PIERACCIONI will celebrate with their audience the arrival of the new year. 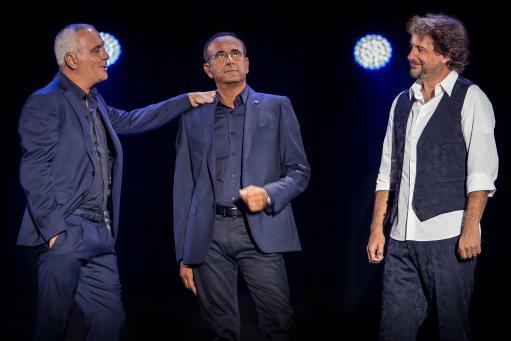 Two hours of sketching, gags and jokes to entertain and have fun: this is the aim of the new theater show by Panariello, Conti and Pieraccioni produced by Friends & Partners. Children under 5 years of age enter free of charge accompanied by an adult, in number of one child per adult, but have no right to occupy a seat. They can buy a specific ticket at the lowest price for the event and enter with a free companion. Tickets are available exclusively by telephone booking at 055/667566. In order to avoid problems and be able to access a suitable accommodation, we strongly advise against the purchase of a generic ticket.